Peter Hickman. Photo: Peter Bull. 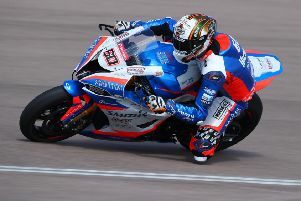 Peter Hickman recorded a fantastic fifth place in Tuesday’s Superstock race at the Isle of Man TT festival, also posting his fastest-ever lap time for the 37.83-mile mountain road course. Not bad for someone who is only in his second year of competing at the event. With the riders setting off at 10-second intervals Hicky, on the Lee Hardy Racing/Briggs Equipment UK BMW, began the four lap affair from 17th but on corrected time was up to eighth place at the first checkpoint. At sector two he was seventh and at Ramsey was in sixth position. He remained in sixth for the rest of the lap and through lap two and when he pulled into the pits for fuel he had recorded his fastest ever lap of the TT course on the second lap just missing out on joining the 130 club with a speed of 129.954mph. After a rapid pit stop, Hicky was out again on his way to Glen Helen for the penultimate time and up to fifth place which he held through lap three. He was beginning to catch the rider in fourth place and when he reached the midway stage of the final lap he was just over a second away from him on corrected time. He was also looking at another flying lap but ran out of fuel on the run to the Grandstand and coasted over the finish line to claim fifth place. Hicky - who lives in Louth but comes from Willoughby - commented: “I thoroughly enjoyed myself out there again today and fifth is a great achievement for me. “I was on for a mid 130mph lap on the final run and would have done it if I hadn’t run out of fuel. Hicky has little time to rest on his laurels as he is out again today riding the Lee Hardy Racing/Iron Maiden Trooper Beer MV Agusta in the second four lap Supersport race. Hickman was also out on Monday evening on the MV Agusta/Iron Maiden Trooper Beer Supersport machine to make his debut in the first Supersport race at the Isle of Man TT festival. But after encountering problems on his refuelling stop he was only able to complete the race in 21st position. Peter has not ridden a Supersport bike for many years but he quickly adapted to it and was soon on the pace. He was the 21st rider away and made good progress to 18th at the first checkpoint at Glen Helen completing the lap in 17th position. On lap two he made his way forward to 13th position as he came in for the pit stop for fuel. But that is when it all went wrong for the Lincolnshire rider as there was a problem firing the bike up again. The team persevered and eventually Peter got away for his final two laps; but he had lost three precious minutes in the pits making it a big ask to get back up the field. At Glen Helen he was registered in 34th place on corrected time and any other rider would have given up; but Peter was determined to bring the bike home to a strong finish and got his head down, making up places to 28th at the end of lap three. On the final lap he was flying, registering 162.5mph through the speed trap at Sulby and completed the final lap in a creditable 21st place, posting his fastest lap of the race with a 123.9mph average speed. Hickman said: “The bike was mega, until she refused to start after the fuel stop; but for that we would have finished in eighth position. “But apart from that I was happy with the bike and my performance, especially setting my fastest time on the final lap.